Since this may be the week that you are putting the final touches on a decorating plan for someone heading to college, you may be interested in some of these tips from this weekend's "Home Inspirations" column. They also work for a home bedroom for a teen or 'tween! The first time most students walk into their dorm room they are greeted with four (white or beige) walls and a somewhat sad single bed. Let's face it. It is not a pretty picture. From Pottery Barn: Key West wall mural is background to room done in blue/green tones.But with a few tips and some thoughtful, creative planning, it can be transformed into a cheerful and creative living and study space that will be functional and fun for nine months! You may not be allowed to paint the walls but you can come up with a color palate that will set the tone. Select a style that works for you. A young college-bound student had me decorate her bedroom at home a few years ago. A theater-major, she was all about everything Broadway. The room was purple and well, spectacular. With murals of NYC, lighting effects and filled with Playbills and framed memorabilia. I was sure that she would want to take this theme with her as she embarks on her college adventure. But she told me this week, no. Not the case. She will take a few small mementos from home but she looks at college as a new start. She will be using blue-green tones and a beach theme. A new chapter and a fresh new style. Focal point: the bed. Accent pillows, throws, sheets and comforters should be where you put the bulk of your budget. 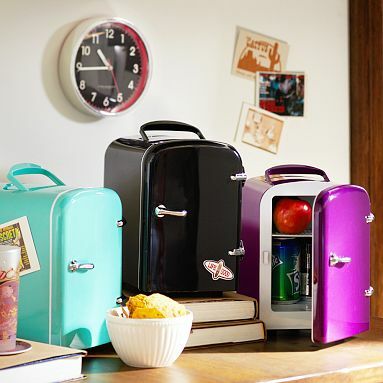 From Pottery Barn: Mini coolers in cool colors. Consider storage. Always at a premium you will want to maximize every inch: Under the bed with risers. Vertical shelving. Hanging closet organizers. Cube ottomans that double as storage. Really cool (and comfortable) sphere chair (very inexpensive) that folds up. Drawers that break apart and can go under bed. Declutter. Start on day one! Only take what you will use and don't be afraid to send some back with mom and dad. You should leave some space open so that you can move and have space for friends to visit. Remember: Less is more and this is a good time to simplify your lifestyle.